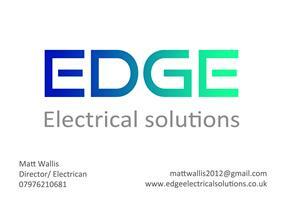 Edge Electrical Solutions - Electrician based in Chew Magna, Avon. I am a Bristol and Chew Valley based electrician. I have a lot of experience in both electrical services and am an NICEIC registered domestic installer. I can provide advice and guidance, whether you are planning on improving or upgrading your electrical systems and need a qualified electrician to meet your requirements. I am fully qualified and certified. I do my upmost to be friendly and helpful. I pride myself on being value for money. If you have a particular project in mind that is not listed, then please contact me. Please also feel free to visit my Facebook page by clicking here.